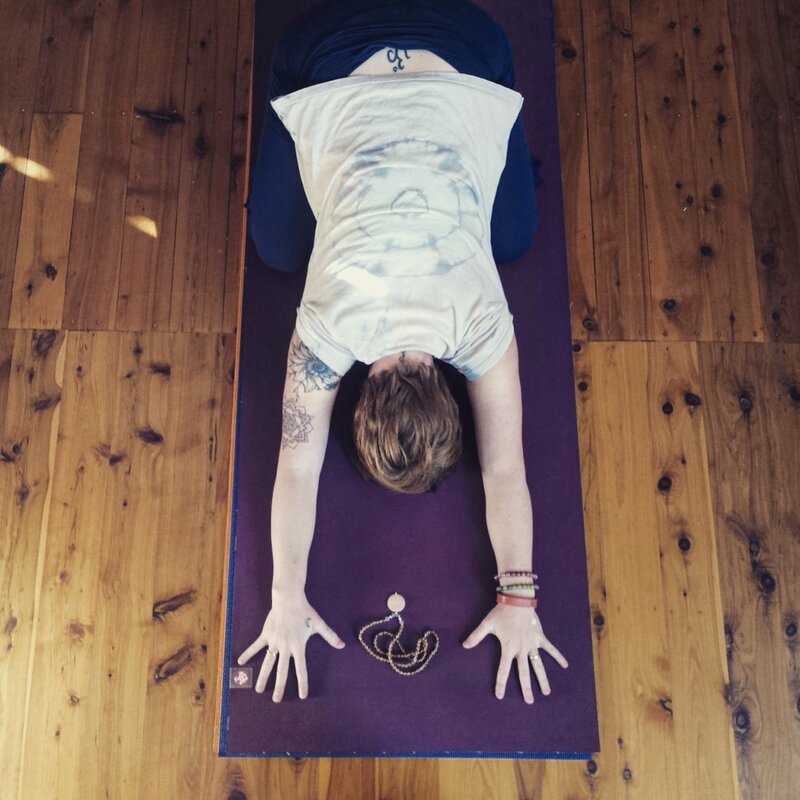 I'm delighted to have Sydney based yoga teacher and mama of two boys, Kate Alexandra here on the blog. I love her delightfully feminine approach to yoga and her openness in showing what yoga looks like for mothers. She is the founder of Radical Self-Care Project which just sings to my heart with her focus on helping women and mothers prioritise self-care. She has just launched a campaign to crowdfund the Radical Self Journal which will guide you to your own self-care practice. As a long-time journaler, I highly recommend you support this self-publishing campaign. I'm so thrilled to share her insights into the intersection of parenthood and yoga here. being a part of a family influenced your perspective on yoga? Honestly motherhood has totally transformed my yoga practice and I know many of my peers feel the same way. Before children, I used to go to classes a few times a week. But since having children, given it’s harder to get to class, I have switched to more of a home based practice. I allow myself to be guided by my intuition and often start with some somatic movement, sometimes it’s classical asana, other times womb yoga or dance and rolling about however my body wants to move. I also practice more pranayama and meditation than asana these days, because of the mental support it gives me to survive on broken sleep, deal with triggers and build the self-awareness needed to parent consciously. I feel so strongly that parenting is a high spiritual practice and it calls me to be more conscious in all areas of my life. While my children and I have fun playing around with asana together and I too enjoy a good stretch alone, it has become less important to me than other aspects of the practice. What I need most from yoga is the ability to be more present, connected and clear in my relating with my children and myself so I can mimimise living out patterns from my samskaras and live more in truth, love and kindness. How does yoga play a part in your life as a parent? During pregnancy, I went to prenatal yoga classes and did lots of guided visualizations to prepare for birth. In the early days of mothering newborns, yoga nidra was my life raft to support me when I was under-slept (it still is!) I would also regularly practice alternate nostril breathing while breastfeeding which helped me to relax and let down milk more effectively. These days with two young boys, I mostly need yoga to help keep my triggers in check. For example when I feel I want things to go a certain way, or I want a particular outcome as a result of my effort that doesn’t work out I need to remember the core teaching of the Bhagavad Gita: to surrender the fruits of my actions, for they are not mine to keep, I must show up and do my duty and surrender the outcome to divine will. This is karma yoga, self-less service and mothering is a lot like that. What wisdom can you offer people who are on the parenting journey? Do your best to parent consciously. Know the impact your thoughts, words and actions have on your children and try to be truly present to them when you are with them. Our presence is the greatest gift we can give our children. And no, I am not perfect at this. I get sucked in to doing the housework, writing articles or posting on social media when my kids are around. It’s a blurry line when you work for yourself and parent close to full time. But I make sure I communicate my intentions and stick to the specified duration for whatever ‘work’ I have to get done. I also have dedicated, playtime with each of my children 1-to-1, as well as together, to foster that deep presence and connection, which can become a bit strained with the arrival of a sibling. I know this time is the most tangible way they feel my love and care. It’s also, often the solution to challenging / boundary pushing behaviour. If I can get 1-to-1 quality time with whomever has been a bit ‘off’ the challenging behaviour resolves quickly. Connection is a balm for their souls and acting out with ‘attention seeking’ behaviour is usually a call for connection. This 1-to-1 time is good for my soul too, I get to just enjoy time with each of my children and dive in with curiosity, no agenda and follow their lead. It’s wonderful watching their personality develop and follow their train of thought, their curiosity, and their joy. about this journal and The Radical Self-Care Project. 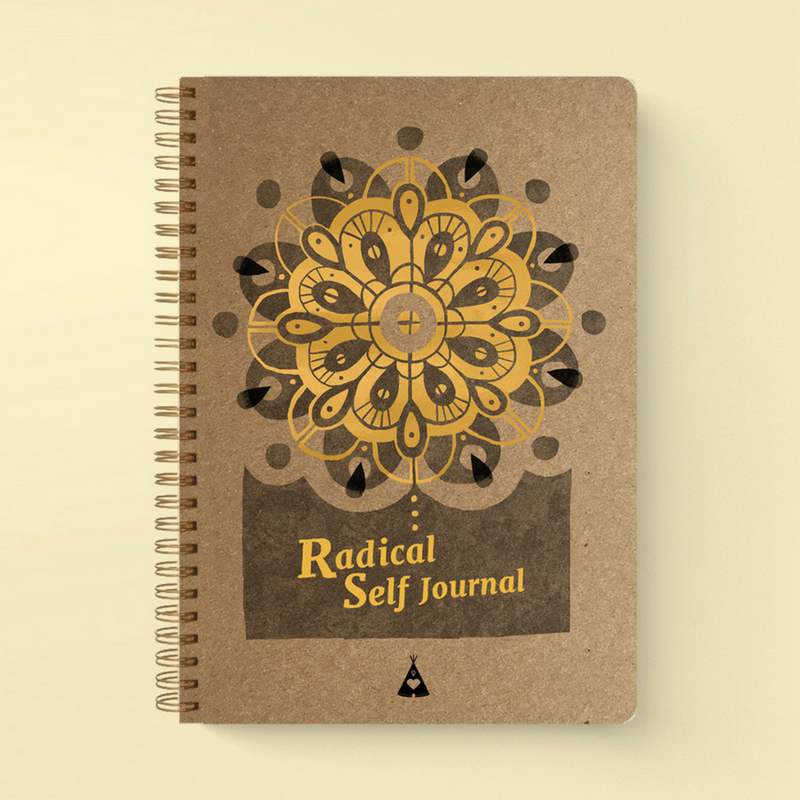 The Radical Self Journal gives you daily writing prompts to reflect on various aspects of self-care; including Routine & Rhythm, Boundaries; Creative Expression; Relationship with Nature; Spirituality; Mindfulness & Mindset; Community Care and Conscious Activism. By writing each day you come into conversation with yourself; you'll reflect on events passed and set intentions for the days to come. Over the 14-week daily writing journey you will better understand what you truly need and the courage and self-compassion to do something about it! themselves by comparison. We need to get real about what is important to us each individually and stop the pressure of trying to do it all. A slow revolution really is in order! Practically speaking though, in my online courses and the Radical Self Journal I help women break down self-care into what feels do-able; ie practicing self-care little and often (just like yoga) is what creates the biggest impact, rather than, say needed to splash out on some big thing only once you have hit the wall.